In late February and early March 2008, a Greylag Goose with an orange collar was seen in the flock in the Shiskine Valley. The identification letters were read using a telescope and the details sent off to the British Trust for Ornithology (BTO). Recently, the appropriately named Bob Swann from the BTO provided background information on this bird. In summary, the goose is part of the Icelandic population marked at Loch Eye in Easter Ross on 15 November 2005. Before being reported on Arran this winter, it had been reported twice from Caithness in February 2006, once at Harpsdale, and on another occasion at St John’s. These geese are part of a long term study, trying to find out whether or not individual geese are faithful to their wintering areas from one winter to the next. 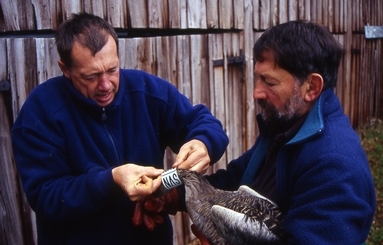 Bob and his co-workers have been involved for the last sixteen years in marking geese in Easter Ross, Iceland, and other places in Scotland. For the welfare of the birds, everyone involved in this type of work is licensed. During this work some birds were marked with leg rings, while others, like the bird that appeared in Arran, were marked with collars. Indeed in Easter Ross 1,483 birds were marked with a plastic neck collar, bearing a unique code, and in Iceland, 532 adults and 213 large goslings were similarly marked. Birds in Scotland were caught with cannon nets at baited sites. Those in Iceland were captured by rounding up, whilst flightless, at moulting sites or whilst attending young. The results of this work and other studies are summarized as follows. In the non-breeding season, most of the Icelandic population of Greylag Geese leave the breeding grounds and migrate south to winter in Britain and Ireland, with smaller numbers wintering in the Faeroe Islands and southern Norway. Most birds arrive in their wintering grounds during October but remain highly mobile until December, often moving quickly between different regions. During the midwinter period (January–February) birds are much less mobile. This is also the case during the spring period (March–April), when most birds remain on their final wintering grounds, prior to a direct flight back to Iceland. While Greylag Geese, like those in Arran, have traditional roosting and feeding areas from year to year, the extent of site fidelity shown by individual geese is more variable. These colour-marking studies have shown that whilst many species do exhibit a high degree of site fidelity, others show a greater range of migration strategies, at least at certain times of the year. It is thought that this movement between areas may allow individual geese to better respond to changes in their environment. a special responsibility for the conservation of these birds. These studies are important in increasing our understanding, and I would encourage anyone who comes across a ringed or marked bird to pass the information directly to the BTO or pass it to me and I will pass it on, on your behalf.